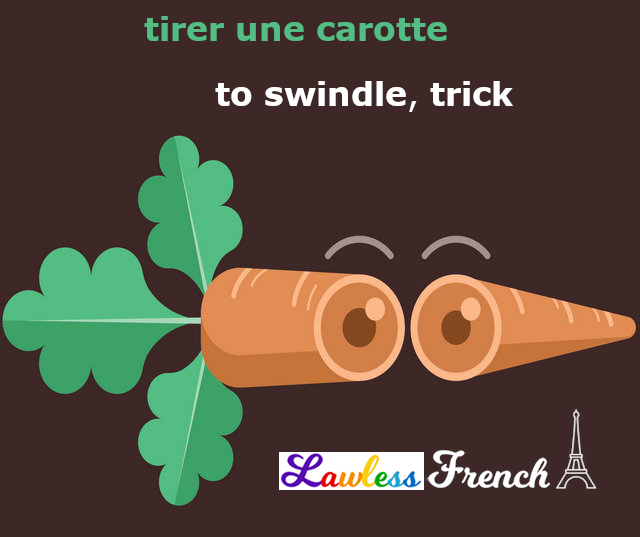 Usage notes: In the idiomatic French expression tirer une carotte (à quelqu’un), carotte refers to a swindle or trick, and tirer means to pull that swindle on someone, to trick her, to take him for a ride, to get her. Regarde, elle va essayer de tirer une carotte à ces étudiants. Watch, she’s going to try to swindle those students. Aurélie déteste ce type ; il lui a tiré une carotte l’année dernière. Aurélie hates that guy; he tricked her last year. The interesting thing about the idiom tirer une carotte is that carotte represents something bad here. Other than perhaps in the expression les carottes sont cuites ! (it’s all over! we/they/you’ve had it! 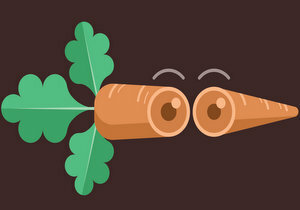 ), in French and English "carrot" generally represents something good. Of course, that’s not to say that the expressions are positive, just that the carotte itself represents something good, even if its purpose within the phrase is nefarious.